Translated by Mark Tankosich MA, this essay, originally written by the founder of Shito-ryu Karate (Mabuni Kenwa), first appeared in Vol. 29, No. 1 of the Hiroshima University of Economics Journal of Humanities, Social and Natural Sciences. Emphasis and illustrations added by me. Published with permission. All right! I believe the man... He´s Mabuni Kenwa, a wise (very, very wise) sensei. Sadly, a lot of people out there don´t show any respect for kata. 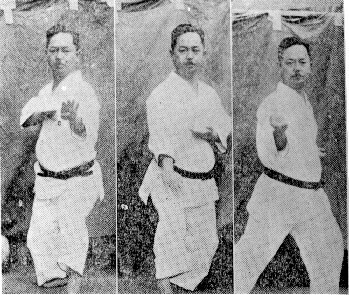 Dominique Valera said this: "kata has no purpose for fighting, this stuff can be seen as a tribute for the ancient masters of the past, or maybe as a good exercise about coordination, but if you are attacked in a real life struggle..." Ok. We´ve heard this opinion so many times. What do you think about it? I agree, there's a karate place in my area that does none to very little kata, and they don't even teach the bunkai! Although the place I go to now does Shito-ryu karate and I feel that I have learned much more and more capable to defend myself. Jesse,While I'm flattered, and sure you had no ill-intent, I would have appreciated your seeking my permission before posting this.While providing a link to my work is one thing, reproducing it like this is another.And yes, you now have my permission. Perhaps you can note that fact on the blog, so that others realize it's appropriate to receive such in a case like this.Please just check with me in the future.Thank you. Hi Mark!I understand you, and thank you. I have now included "With permission..."I have frequently seen this translation on other websites (probably without your permission! ), so I thought it was a shame if I hadn't posted it. Now I know better. :)Arigatô gozaimashita! I think what the people who argue about kata not being relevant to real fighting or self-defense miss the point - in addition to being "libraries" of movements, when practiced mindfully they reinforce the fundamentals necessary to fight or defend oneself as effectively as possible.Mabuni's statement about only needing two or three forms really caught my attention because in Wing Chun we only have three hand forms, but a lot of emphasis is placed on their practice, particularly the first form which contains the majority of the style's hand techniques.Like what Bruce Lee said about not being afraid of the man who practiced 10,000 kicks once, but fearing the man who practiced one kick 10,000 times, it makes sense that you'd get more out of mastering a few forms than just being good at a dozen. Two or three kata makes sense to me (I currently practice Sanchin, Uechi-Ryu version and Seienchin). I've come across this idea many times including a statement from Shinyu Gushi that the practice of Sanchin alone would be enough, kata wise. However, from what I've seen very few people adhere to this idea and are often part of a system that requires practitioners to 'know' many kata in order to progress through the ranks. At one level, it would be possible to practice a couple of boxing style punches and spar, full contact, which would be great preparation for most street fights.